We’d love your help. Let us know what’s wrong with this preview of The Teashop on the Corner by Milly Johnson. When Will Linton's business goes bust he at least thinks that with the support of his trophy wife Nicole he will ris At her beloved husband's funeral, Carla Pride discovers that Martin never divorced his first wife and has been living a double life with her. And his other wife, Julie Pride, is determined to take everything from Carla - her home, her money, and her memories. To ask other readers questions about The Teashop on the Corner, please sign up. If this story doesn’t make you cry, your heart may be made of stone. The Teashop on the Corner has an endearing cast of main characters. Real people you feel you know and want to be friends with. Carla finds out after the death of her husband that her whole marriage has been a lie. Will has worked hard to build his business to the level where he and his wife can afford a life of luxury only to loose it all after a bad investment. Molly, who only ever wanted to find her prince, feels that life has si If this story doesn’t make you cry, your heart may be made of stone. Molly, who only ever wanted to find her prince, feels that life has simply slipped away from her. Shaun, brought up in foster homes and boys homes, had never known a mother’s love and his heart had frozen over. He now filled his days with work and books. Leni, the teashop owner, has a smile for everyone and a willing ear to listen whenever needed. But buries her own hurt deep inside. Pavitar, the retired surgeon, finds himself alone and lonely after his wife’s death. They each happenstance upon the teashop on the corner as if it was beckoning them to come inside. Once inside they found friendship and acceptance. The Teashop on the Corner has a perfect mix of tea, cake, books and friendship. Johnson’s descriptions of Leni’s literary wares makes me want to jump straight online to find some of these gems for myself. It fills me with a need to read the classics mentioned throughout the novel. I fell in love with every character and I was captivated by their stories of love, loss and second chances. I just wanted to give Molly a big hug. 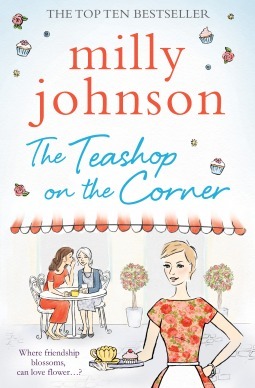 The Teashop on the corner is Milly Johnson’s tenth novel. Johnson was the recipient of RNA’s RomCom award 2014. I recommend this novel to anyone who loves new found friendships and happy endings. Es la primera novela que leo de Milly Johnson y me ha gustado mucho la sensibilidad con la que describe los personajes y el finísimo sentido del humor con el que relata escenas dramáticas. "El café de los corazones solitarios" es una novela coral, en mi oponión hay dos historias principales y dos (o tres, según se mire) historias secundarias y el hilo que las une con elegancia es el café del título, que casi tiene vida propia. Al principio me costó un poco entrar en la histor 4 estrellas y media. "El café de los corazones solitarios" es una novela coral, en mi oponión hay dos historias principales y dos (o tres, según se mire) historias secundarias y el hilo que las une con elegancia es el café del título, que casi tiene vida propia. Al principio me costó un poco entrar en la historia pues los capítulos son muy cortos y la autora los utuliza para ir cambiando el punto de vista de narrador, que siempre es en tercera persona. Pero cuando entré en la dinámica me resultó fascinante y debo confesar que admiro a la autora por ser capaz de llevar tantas historias al mismo tiempo. A mi parte romántica le habría gustado que la historia de Leni y Shaw estuviera más desarollada, aunque lo cierto es que es casi perfecta. This has got to be THE BEST book I've read this year, and I sure have read a lot of good ones lately. It's amazing! It's one of these books that despite being quite thick in pages, you'll devour in on or two sittings. It's PERFECT, from beginning to the end in every possible aspect. The story might seem complex at first, with many characters and their stories overlapping, but once you get into it you won't be able to put this book down. The Teashop on the Corner is a lovely spot owned by Leni, a pretty much upbeat person who loves serving delicious cakes and everything literary. Her little shop soon becomes a place where Molly and Carla come to escape from the their problems and cruel reality, but also a place where over Bronte and other classics they bond and form new interesting friendships. All of these characters are going through a tough period, their life is pretty much at a crossroad, so Leni's cakes and the goodies she sells in her shop offer them more than just comfort. It offers them peace and a sense of belonging. I honestly didn't expect this book to get all these feelings out of me! I remember, when I reached the end, I had tears in my eyes, but at the same time I was so happy for each of these characters. It happens rarely that a chick lit hits me so hard emotionally. It could be the fact that this story sounded so SO real, and the cast of characters is just fantastic. They each fight their own demons, they are flawed just like any real person. So, connecting with each one of them was really something inevitable. Milly Johnson's writing is pure perfection. She controls every situation and the development of her characters, and one could tell Milly has been very very careful in plotting her story. I follow Milly's updates on twitter and recently read a tweet by one of her fans asking her how did she manage to create such wonderful, real characters. Her answer was she loves people, so it wasn't really that hard for her. Brilliant and oh so true! From the first page, these wonderful characters will draw you in their lives and you'll feel like you're sitting next to them. You will be transported to this wonderful shop, devouring a delicious cake and being in awe of all the amazing stuff Leni is selling. Honestly, I know it's impossible to write a review that will do this book justice. I've read quite good ones by my friends/bloggers, however, seems all of us admits it's truly hard to find the right words to describe just how amazing this book is. I'm sure of one thing though, it's not gonna be easy to find a book that will top it and it's very probable I will re-read it despite my massive tbr list. But, just like with classics whose beauty you discover each time you read them, each time finding a new dimension, I know I gotta be back at 'The Teashop on The Corner'. I already miss the guys so much. Brilliant book you MUST NOT miss out on! I know your tbr list never gets smaller, but trust me YOU NEED THIS BOOK. So, no matter how busy your life is or how many books you need to review, just get a copy and let Milly transport you to this wonderful place. And just feel the love, the hope and the warmth pouring from it's pages. The Teashop on the Corner is such a place and I've spent the last few days right there, along with some wonderful characters. Sadly, the teashop does not really exist, but has been created by the fabulous Milly Johnson as the setting for her tenth novel .... and in my opinion, her very best story by far. Leni has just opened her teashop in a development of new shops, she has created her shop with great care and it encompasses everything that she loves most in life; cake, books and meeting people. The story revolves around the teashop and it's customers; a bunch of people who would be unlikely to meet if it were not for this little oasis of calm that begins to be very important to them all. Carla, newly widowed and in shock. Not because her husband died so young and so suddenly, but because she found out that he really wasn't the person that she thought he'd been. Carla feels as though the past ten years have been a lie. Molly and Harvey; an elderly couple who divorced years ago and have been reunited and are discovering so much about each other and what they have missed. Will; bankrupt, homeless and now single after his materialistic wife has made it quite clear that she is not prepared to live without the big house, the fancy car, the hair extensions and the designer bags. Pavitar; retired surgeon, a true gentleman and so very lonely after the death of his beloved wife. Shaun is the developer of the site. A big brash Irishman who doesn't show emotion and really doesn't do lovey-dovey and all of that mush. And Ryan; a teenager from the roughest family in Barnsley who just wants to read books and distance himself from his loutish father and convict brothers. And finally there's Leni - owner of the teashop, baker of cakes, fixer and arranger, but who is hiding heartache and pain beneath her smiling exterior. Each of these characters come together to form a near as damn it perfect story. A light and easy read with characters who seem so real, yet that deals with some quite serious and emotional issues at it's heart. Milly Johnson writes with warmth and with humour, she creates characters that the reader really really wants to be friends with, she has created a teashop that every book lover would dream of visiting. She understands people and how they operate, and her characters are charming and oh so realistic. A story packed with love and relationships and the power of friendships. There are regrets and there are consequences and the reader learns how life can be altered so quickly, but how humans really can pull together to bring comfort to others. 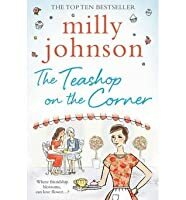 Milly Johnson fans will be delighted by The Teashop on the Corner, and new readers of this author will wonder why they've not read her books before now. La verdad es que estoy alucinada como escribe esta autora es el segundo libro que leo de ella y sigo pensando en leerme todas sus entregas. Escribe de una manera maravillosa.. Milly tiene una pluma excepcional, quedas enganchada a sus páginas desde el primer capítulo, leerla es puro gustazo, Milly desborda magia en cada palabra, te transporta a sus escenarios y los sientes y vives junto con sus adorables personajes. Es un libro sencillo pero hermoso aunque en ciertas partes me estanq 3,5 casi 4. La verdad es que estoy alucinada como escribe esta autora es el segundo libro que leo de ella y sigo pensando en leerme todas sus entregas. Escribe de una manera maravillosa.. Milly tiene una pluma excepcional, quedas enganchada a sus páginas desde el primer capítulo, leerla es puro gustazo, Milly desborda magia en cada palabra, te transporta a sus escenarios y los sientes y vives junto con sus adorables personajes. Es un libro sencillo pero hermoso aunque en ciertas partes me estanqué un poco eso no me hizo desistir de seguir leyéndola porque vuelvo y repito esta mujer tiene algo que te amarra a sus letras e historias..
Every time Milly Johnson releases a new book, I'm like a small child at Christmas - I can't contain myself or think of anything else until I've opened it up and devoured it. It's getting quite difficult now to say anything new about her books - I reviewed It's Raining Men on my blog last year, and several others on Goodreads before that, and never make any secret of the fact that I'm an unashamed fan and that, for me, she can do no wrong. This book has everything we've come to expect - the big c Every time Milly Johnson releases a new book, I'm like a small child at Christmas - I can't contain myself or think of anything else until I've opened it up and devoured it. It's getting quite difficult now to say anything new about her books - I reviewed It's Raining Men on my blog last year, and several others on Goodreads before that, and never make any secret of the fact that I'm an unashamed fan and that, for me, she can do no wrong. This book has everything we've come to expect - the big characters, the personal dramas, the romance, the friendships and the sparkling humour. There might be something of an over-proliferation of cupcake cafes, teashops and book shops in women's writing at the moment, but the device really works so well in the same way as the Queen Vic and Rover's Return do in our favourite soaps. Leni's teashop is a wonderful place - I spotted so many items on her literary themed shelves that I'd like to buy, and how I'd love to join in on one of her themed days, talking about books and having a slice of Branwell carrot or Wuthering milk chocolate cake. The book follows through Leni's story and that of all her customers, as well as the stories young assistant Ryan and property developer Shaun McCarthy. Every story is wonderful, full of drama and sadness, tears and laughter. This book was an absolute joy to read, I totally and utterly loved it right from page one. Leni’s teashop “The Teashop on the Corner” is the sort of tea shop anyone would love to have on their doorstep. Scrumptious cakes and coffee, surrounded by gorgeous items of literary based stationery to buy with a clientele who like nothing better than to have a good literary debate. Leni’s customers all have something in common. They are all at crossroads in their lives and need someone for advice, support This book was an absolute joy to read, I totally and utterly loved it right from page one. Leni’s teashop “The Teashop on the Corner” is the sort of tea shop anyone would love to have on their doorstep. Scrumptious cakes and coffee, surrounded by gorgeous items of literary based stationery to buy with a clientele who like nothing better than to have a good literary debate. Leni’s customers all have something in common. They are all at crossroads in their lives and need someone for advice, support and comfort. As they all get to know each other and forge real friendships, they all seem to find that certain something that was missing from their lives. They quickly form a really close knit little group of friends, friends who will look out for each other in hard times as well as good. There are a number of characters and the story is told from several alternating viewpoints, but I never seemed to get confused by the changes in perspective. I really enjoyed every separate strand to the story and would be hard pushed to claim any favourite, although if I had to, I would say that Molly’s story did really capture my heart a little. It is a book that will make you smile, stuffed with (mostly) lovely characters, full of charm and lovely cakes. It is definitely a feel good story for most of it, but I have to warn you, a few pages before the end, I had tears absolutely pouring down my face. This is an absolutely fantastic book to read. Highly recommended. Many thanks to the publisher for the ARC in return for an honest review. Having just this minute finished reading The Teashop on the Corner by Milly Johnson, I am so sad to have to leave the wonderful group of characters behind but also I am still buzzing at what an incredible read this was. The gorgeous Tea Shop on the Corner in Spring Hill Square has recently been opened by the lovely Leni Merryman, her dream of owning her own tea shop that also specialises in rare quirky literary gifts and stationary has finally come true but she could never have imagined that her Having just this minute finished reading The Teashop on the Corner by Milly Johnson, I am so sad to have to leave the wonderful group of characters behind but also I am still buzzing at what an incredible read this was. The gorgeous Tea Shop on the Corner in Spring Hill Square has recently been opened by the lovely Leni Merryman, her dream of owning her own tea shop that also specialises in rare quirky literary gifts and stationary has finally come true but she could never have imagined that her little shop would bring a friendly safe haven for a group of people who are all at a challenging and emotional time in their lives. Carla has just laid her husband to rest but has now found out an explosive secret he had been hiding. Business man Will has lost everything his business, his money, his home and now his wife. The lovely Molly has been heartbroken for many years and now out of the blue her ex arrives on her doorstep but can she forgive him? The characters in this book are so full of life even when they are down on their luck they just seem so realistic and they are certainly characters I won’t forget in a hurry. There are a lot of main characters in this book and each and every one of them were so well developed so there was no confusion at any point as to who was who. I loved each and every one of these wonderful characters they all brought their own little something to the storyline and their stories weaved around each other’s perfectly joining them all together for our storyline. This was such a compelling read I literally did not put it down as the storyline just swept me away and there was always something going on so there wasn’t a safe place to stop other than the end! The way in which the author describes the little shop, as well as the quirky gifts inside, makes you really feel as though you are sitting there with the characters, if only I could get my hands on some of her gifts. The storyline is about heartbreak, loss and peoples second chances but yet it is still a storyline full of love and hope so I found it quite an uplifting read. I think I have never before struggled so much to write a review. Here the reason is very simple: this story was about normal people, about friendship and forgiveness and it was just beautiful. And here my review could end because I guess I can never in a million years do this book a justice with my words. But I'll try anyway. I have finished reading it a few weeks ago but the thoughts and feelings are still bouncing around in my head and I really have problems to knock a proper sentence about my I think I have never before struggled so much to write a review. Here the reason is very simple: this story was about normal people, about friendship and forgiveness and it was just beautiful. And here my review could end because I guess I can never in a million years do this book a justice with my words. But I'll try anyway. I have finished reading it a few weeks ago but the thoughts and feelings are still bouncing around in my head and I really have problems to knock a proper sentence about my feelings together. There are not many books that left me in such a state and that stay with me for so long. Since I have read "Here Come the Girls" I fell in love with Milly's writing and although this book still stays on the pole position in my favourites, "The Teashop on the Corner" is very, very high in my rating, just behind. Probably I should create a new rating scale because I would give this book many, many more as only 5 stars. "The Teashop on the Corner" is about a great bunch of characters, each of them with their own problems, each of them with their own demons which they try to battle. Carla is newly widowed and has just discovered that her beloved and worshipped husband was actually a cheater and led a double - life. He was not the person Carla thought he really was and her marriage was a lie. Molly thinks that she loses it, or rather her son and her daughter - in - law try to persuade her that she loses it and want her to move to a care home. But Molly is full of life and full in control of her life although she can't guess that her long - lost true love will turn one day on her doorstep and that his return will actually change the rest of her life. Leni has just opened her Teashop on the Corner. It's not a usual tea shop but also a gift shop for everything connected with books. Leni, her warmth, brilliant cakes and Jane Austen & Co's themed Tuesdays attract at least a group of faithful customers who can't imagine now how they lived without their book discussions... The Teashop is actually the most important character in this book because everything finally revolves around it and nothing can happen without it. I loved this Teashop, just like this, and would do much to have such a shop somewhere on the corner. The description of this shop were lovely, delightful and delicious, and I don't mean only cakes. The whole idea was lovely, the books, stationery, and all booky gifts were brilliant and just my idea of heaven. There are also the male characters, as important as the girls. Will, who used to live a very rich life, is now bankrupt, homeless and is facing a divorce. Shaun, the developer, closed and not showing his emotions, introvert, but in fact looking for his place and his people in this world, although he himself doesn't realise it yet. Pavitar, a regular customer of Leni's, retired surgeon. Harvey, Molly's lost love, who actually returns to her only to leave her again... and let's not forget Ryan, a teenager who also finds his way to and place in The Teashop. With so many characters, and so many alternating plots, with the story told from so many point of views there was not a single moment that I felt confused or didn't know who is who. They stories and characters are just brilliantly written and developed and I can't say that I have my favourites. I had fell for all of them and kept my fingers crossed for all of them, I actually felt that I live and breath with them. They are all on crossroads with their lives, they have their challenges and perhaps this makes this book so exceptional and realistic in perception. At the first sight the characters have nothing in common but slowly, as the plot develops, their lives become intertwine, they friendship develops and they can't imagine not seeing each other at the Teashop on the Corner. What draws them together is the fact that they all are at crossroads in their lives, and although they don't know it themselves, they seek other people, their closeness, warmth and optimism. The group that they so quickly form is a perfect getaway from everyday problems and their demons and they know they can count on each other in good and in hard times, they know they have a place they can return to and they find a consolation there. Milly Johnson is an exceptional writer. She can capture characters, emotions and feelings in a magic way and then write about them with heart and love. I could feel that she gave the characters everything she could. They felt so real, not at all overdrawn, they were vivid and everything that happened in the book you could relate to, you could nod with understanding and gasp and say: oh my goodness, I know! Almost from the beginning I had a feeling that I know what happened with Anne, which doesn't make me feel better or cleverer, no way, I just wanted to know if my suspicions are correct and what was the reason. I really felt heartbroken reading what actually happened and the way Leni was trying to cope. There is so much sadness in her story but in some way it also feels uplifting and heart - warming. This is a typicall Molly's book where happiness and sadness are mixed together, a book that makes you laugh and cry. Book that, although on one hand light and optimistic, on the other deals also with important issues but in a very accessible way. Not your usual fluffy read but also not a hard, depressing story. Written with so much love and a wonderful subtlety and feeling for the characters it is absolutely a must read for this summer and will leave you feel happy and warm inside. I have read many good books this year but this one is one of my private gems so far. It has it all: love, friendship, drama, romance, characters larger than life, sparkling humour and very realistic plot. This book left a big impact on me, left me actually speechless for a very long time. If you are a fan of Milly Johnson - I don't have to recommend this book to you because I'm sure you have read it and loved it as much as I did. If not - please go and buy a copy for you, this will be the best spent money ever. Me embriaga un gran gozo cuando acabo un libro que me ha tenido prendada durante toda la lectura. Sobre todo cuando descubro un nuevo autor que tal vez sea famoso, por qué no, pero del que yo no había leído nada hasta el momento. Esta novela encierra muchas historias y mensajes en sus páginas. Milly tiene una forma de narrar dinámica y amena, que te hace querer saber más y no poder despegarte de la pantalla (o páginas). Los personajes son entrañables, finamente y cuidadosamente perfilados los vam Me embriaga un gran gozo cuando acabo un libro que me ha tenido prendada durante toda la lectura. Sobre todo cuando descubro un nuevo autor que tal vez sea famoso, por qué no, pero del que yo no había leído nada hasta el momento. Los personajes son entrañables, finamente y cuidadosamente perfilados los vamos descubriendo a lo largo de los capítulos (cortos pero intensos), encariñándonos con cada uno de ellos. Ahora que he terminado de leerlo, con una sonrisa en los labios, me siento algo triste porque quisiera poder seguir leyendo más sobre estos amigos del Café de la Esquina en donde por casualidad encontraron la felicidad, la amistad, el amor y un futuro que ninguno de ellos habría pensado poder llegar a vivir. I absolutely LOVED 'The Teashop on the Corner' by Milly Johnson. If I could have rated it higher than five stars, I most definitely would. It was beautifully written, with a refreshing mix of truly believable characters, each one brought to life in my mind by Milly's excellent characterization. I laughed out loud many times, her humour is superb. I also shed a few tears. De verdad este libro fue toda una aventura de leer, la autora logra retratar lo cruda que puede ser la vida de la mejor manera posible. El hecho de que hubiera tantos personajes lo hizo una lectura rápida e increíble. Oh my goodness another smashing read by Milly Johnson! Absolutely love the characters the whole essence of love! I blubbed and laughed through this emotional roller coaster of a ride! Thank goodness for the world that is Milly with her ever lovely ladies, rotten scoundrels made good and those fellas that race in on their steeds to save the damsel! El hecho de que este contada de varios puntos de vista me gusta, hace que la lectura sea un visto y no visto, se lee enseguida. Otra cosas que me ha gustado mucho es el que todos los personajes cuenten con una edad ya adulta. Un libro que recomiendo . Sorpresa muy grata al leerlo, una pequeña joya. Lo recomiendo mucho. Además, está a 5.95€ en Amazon, muy barato y os aseguro que este libro vale más ! Milly Johnson at her best...this book makes you laugh, cry, scream and everything in between. The characters are so lovingly brought to life in this tale of love, loss and friendship. As always, I couldn't give a Milly Johnson book less than 5 stars. And this one in particular definitely pulls at your heartstrings. I picked it up from a charity shop and I'm so glad that I did! I've loved all of Milly's novels and I couldn't wait to sink my teeth into this one - the choice of what to read next was between three of her novels so I will be reading those other two soon and reviewing! So watch this space! The cover doesn't give much away but is cute and I love it. I love the stripped awning, the cupcake, the flowers - it's all so pretty! The story itself really was heart-wrenching. Urgh. It was beautiful! This novel was another one of my ever-growing favourites by Milly Johnson. At first, I'll admit I was getting a tad confused because it just seemed like there were so many characters and so many different stories going on but after a bit I got into it and started to learn as well as relate to all of the characters. The story follows many different characters, as mentioned above, and they all have their own individually heartbreaking stories. Carla has just found out that her husband isn't who she thought he was and is now wondering if her marriage was a lie. She struggles to keep positive until meeting Will Linton, who has also had a heart time recently. Molly is lost, she hasn't ever found someone who can replace the love of her life but then she's in for the biggest shock ever when he returns on her doorstep one day begging for her forgiveness! The characters are all wonderful. And amongst them all is kind and caring Leni. Leni owns the Teashop where they all meet and is probably the nicest character I've ever read about! I shed a little tear when reading about her daughter Anne but I have to admit that my favourite character was definitely Ryan. He pulled at my heartstrings and I was just hoping and praying everything would work out for him! I guess you need to read it if you want to find out what happens to our dear Ryan in the end! Esta autora nunca decepciona. Me encantan todos los libros que he leído de ella y este no ha sido la excepción. De hecho, a pesar de lo largo que es, se me ha hecho corto. Me hubiera encantado seguir acompañando a estos personajes tras todos los cambios que sufren sus vidas a lo largo de la novela, y me ha encantado, además, que hubiera tantos personajes y que fuesen todos tan diferentes entre sí, porque así se complementan y forman un puzle en el que todos tienen su lugar. Carla y Molly son, di Esta autora nunca decepciona. Me encantan todos los libros que he leído de ella y este no ha sido la excepción. De hecho, a pesar de lo largo que es, se me ha hecho corto. Me hubiera encantado seguir acompañando a estos personajes tras todos los cambios que sufren sus vidas a lo largo de la novela, y me ha encantado, además, que hubiera tantos personajes y que fuesen todos tan diferentes entre sí, porque así se complementan y forman un puzle en el que todos tienen su lugar. Carla y Molly son, diría yo, las que tienen más protagonismo, pero Leni, la dueña de El Café de la Esquina, no se queda atrás, ni tampoco Will, ni Shaun, ni Ryan. Creo que la magia de este libro, y de todos los de la autora, está no sólo en su manera de escribir, sino en que cuenta historias tan reales, que podrían sucederle a cualquiera, que es imposible que no te identifiques con sus personajes. Incluso aunque hayas tenido una vida completamente opuesta a la de ellos. I love love loved this book & it has entered my list of favourites ever. I loved the plots, the characters & the entire sentiment of the book. The book was filled with humour and had me laughing out loud right from the very first chapter. It also explored so many different emotional topics from I love love loved this book & it has entered my list of favourites ever. I loved the plots, the characters & the entire sentiment of the book. Me encantó! Amé todos los personajes! Hermosas e intensas historias, muy bien contadas. Now I read this book purely because one of the loveliest people I know asked me to, I did not go in with high expectations. This book was beautiful! Yes I saw every 'twist' coming, so the book was predictable but it was also cosy and a joy to read. The characters were so life affirming and I cared so deeply about them that even though I knew what would happen to them I had to read to make sure they got the happy endings they deserved. I was so invested that I shed many a tear. If you want to read Now I read this book purely because one of the loveliest people I know asked me to, I did not go in with high expectations. Admittedly it took me a few chapters to get into this book.....there are a lot of different character stories that cross path in the teashop, and I found it a little bitty at the start. Once I was hooked I couldn't put it down - read the last 200 pages in one sitting!! Heart-warming and uplifting book. Highly recommend it. She trained as an actress, teacher, an accountant, a Customer Services and Suggestion Scheme Manager as well as working in a variety of administrative posts for companies dealing with anything from antique furnit Milly Johnson was born in Barnsley, raised in Barnsley and still lives in Barnsley - although she did study in Exeter for four years and emigrate to Haworth in West Yorkshire in the 1980s.